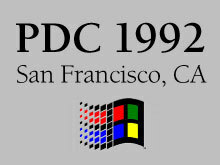 PDC 1992 was better known as the Win32 Professional Developers Conference and took place at the Moscone Center in San Francisco, California in July. 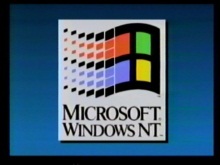 Attendees saw the first demonstration of the Win32 API and first mention of "Chicago", which would eventually become Windows 95. It is estimated that over 5,000 developers were in attendance and conference attendees were all sent Windows NT 3.1 Preliminary Release for Developers (build 297).